Gary faces rejection by the tenure board. At the end of seven years, Gary has begun the tenure process. He begins the term with a class in Humanities, teaching them Sir Gawain and the Green Knight. Gary runs into Dr. Aldon Weiss (English Department chairman) and they talk about the tenure process with Gary growing increasingly frustrated. After he doesn't receive the department's recommendation, Gary gets depressed and hangs out at Michael's place watching golf while Michael and Melissa try to talk him into fighting for tenure. Roger, an obsessive pre-med student from the Humanities class, comes by Gary's office and gets into a discussion about heroic quests. Gary has a hilarious day dream revolving around Sir Gawain and the Green Knight and the tenure committee. Gary doesn't get tenure and he starts thinking about other careers, even trying to make up ad copy with Michael and Elliot. Gary grows even more frustrated at work as Mary, his thesis student, begins to play it safe with departmental politics and Roger continues to hang around. Michael tries to help so hard that he and Gary get into an enormous fight at school. Gary finally provokes Roger into being passionately angry, saying how much med school means to him and how he'd fight anything for it, which leads Gary to acknowledge Roger's "quest" as worthy (even if it doesn't involve literature). Michael and Gary make up, then Gary begs Weiss to help him appeal for tenure and they set off on an uphill battle. In an incredibly unrelated subplot and after much agonizing and a nasty run in with the loan officer over her credit report [a May 1984 incident involving a $145 pair of off-white pumps to wear to Dana Paving's wedding] and a detailed inspection of the place by Gary, Ellyn decides to buy her apartment on the coop offer. Gary has two publications--"Aspects of Early English Literate Poetry" and "Motiff Index of Early Icelandic Folk Tales"
Michael is wearing more of those thin knit ties everyone loved in the '80s. Ellyn's hair is looking much better. Gary has a great fantasy about bursting into the tenure meeting as a knight on horseback, playing out the role of the Green Knight. These people (Gary and Michael in particular) have horrible fights with each other, then make up in record time as if nothing they say to each other has a lasting effect. It does not, in my experience, work this way. The excessive quoting of Gawain serves as a metaphor for Gary's struggle against the games of the department and his quest for the right to teach and study. 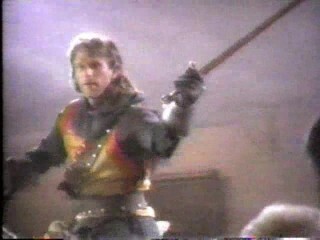 The name of the college where Gary teaches is Havonhurst, which is the name of the college in Class of '96, the show which Peter Horton created.